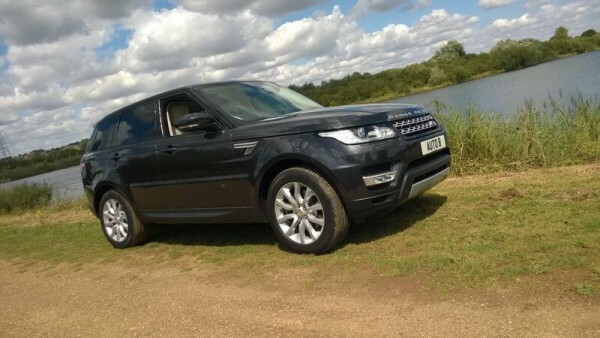 The new Range Rover Sport HSE – Much classier and less aggressive than its predecessor. Many vehicles are by-words for the kind of image or customer base they have identified with purely on legend alone. 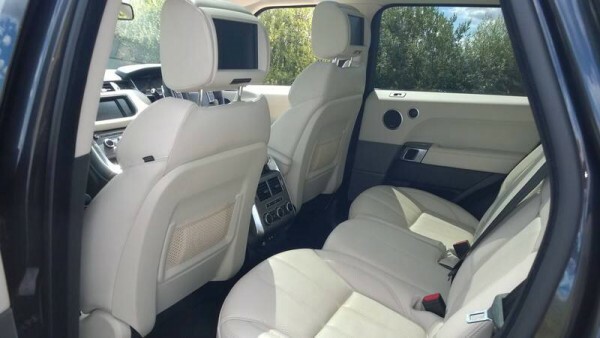 Just like “Transit” is to the world of white van man or light haulage… Range Rover is the same to the discerning buyer who requires go anywhere ability with the luxury and long distance prowess of an executive car. Of course, the Range Rover Sport has rivalry in spades with young upstarts nibbling at its ankles like the Audi Q7, BMW X5, and Mercedes ML, but none of the other aforementioned have that certain style and image which makes the Sport look equally at home loading up the weekly shop at Sainsbugs or mixing with the elite in Monte Carlo. Its the chosen brand of Princes and the aspirational desire of Paupers – few others can match that. 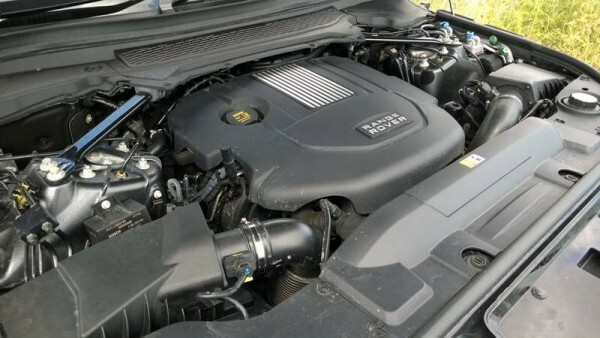 The 3.0 SDV6 kicks out 275Ps and is mated to a ZF 8 speed auto box. Its very refined and sounds sublime too. A light right foot rewards you with surprisingly good fuel returns. Press on hard and it rewards you with more than ample performance. The model on test was the HSE fitted with the well regarded SDV6 3.0 turbo diesel, it develops a healthy 275Ps of power and more than enough torque to raise a smile with a twitch of the brogue. This new current shape is more rounded than its predecessor and looks smooth and distinguished yet not as aggressive – which is a good thing I reckon, this may go some way to shake off an unfair almost “thugish” image. Sport now looks more like a shrunken down bona fide Range Rover, but don’t think you are compromising on usable practicality, there’s plenty of room for both passengers and boxes. The test car also came with the optional 3rd row of seats that are deployed with a push of a button that’s located just inside the rear door jamb and inside the boot itself, though the deployment of the seats was painfully slow. Plenty of room for passengers or business meetings. DVD screens are part of an audio upgrade that also features top quality bluetooth head phones. All seats are comfortable, well supportive and beautifully hand crafted. No real complaints were to be found with the first impression of fit and finish and the paintwork looked very businesslike in the test car’s shade of Causeway Grey. One thing I did happen to notice was the rather loose and wobbly feeling to the otherwise chunky door handles. For a component that really does hammer home a feeling of security and quality, I would have expected much much better of a Range Rover. The nicely presented interior was slightly spoilt by a squeak from somewhere in the rear and a loose feeling indicator stalk. The tailgate unlike its bigger brother is a single piece design that opens on the click of the keyfob revealing a flat floor – extendable by folding down the seat backs and removing the sliding tonneau cover. The extra row of seats takes up the space that would normally allow a couple of extra cubic feet of “hidey-hole” for valuable odds n ends like camera’s and so on. The rather chunky feeling doors open up into a world thats so very Range Rover – lashings of cream hide and plush carpet that are both a treat for your nose and eyes. Once aboard, the Sport is a world of traditional meeting tomorrow. Good ergonomics and driving position. The 8 speed autobox features tiptronic and paddle shift functions. The polished alloy trim around the centre console reflects direct sunshine but looks very smart. Even with the air suspension lowered to “access mode” it’s still an undignified hop into the cockpit, but once achieved, its worth that little extra effort. The JLR standard knobs and switches fall easily to hand and in terms of ergonomics, only the inns and outs of the infotainment and extra settings functions of the computer require a moments familiarisation. 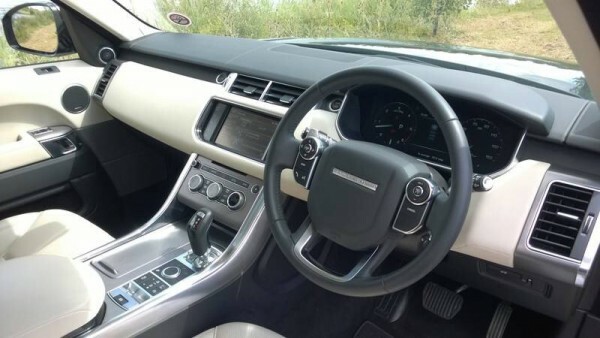 The car works straight out of the box and anyone trading up from a Freelander 2 or down from a Range Rover itself will have little problem acclimatising themselves to the new Range Rover Sport. Head, elbow and legroom should suffice for all shapes and sizes, my portly frame had no problems behind the wheel. As you would expect, the adjustment for your seats and steering wheel is labour free with electric multi-memory controls – even the well supporting front seats offer a little extra comfort thanks to a pair of armrests. Between the well proportioned front chairs is a well sized cubby box that also features your extra media inputs for the Hi-Fi which for the record – has a crystal clear sound quality for the sound connoisseur. As with the current Jaguar XJ and Range Rover, the sport features virtual computer generated dial and needles but the test car seemed to have an issue with the fuel gauge – even with a fully topped tank it never read full. The calibrations and appearance of the dials look convincing enough, only the font of the computer / audio system look dated and slightly clumsy in use. You have sensible sized door pockets, a spacious glovebox and a deep aforementioned central cubby box to keep the cockpit clutter free. It looks good from every angle and those 20″ rims hide an impressive braking / air suspension & computer controlled terrain response 4wd system. Good sized boot too but the optional third row of seats robs underfloor storage. Firing up the SDV6 plant even when cold brings no more than a muted thrum into the cabin and turning the ornate rotary drive selector into “D” sees you waft away with all the class, refinement and distinction of a luxury car. The air suspension irons out all but the roughest of ruts around town but really comes into its own once a pace has been built up. Very little noise from the road is transmitted into the cabin – only the lofty driving position makes you realise you’re not actually driving a luxury saloon car. There’s seriously good brakes there too to reign in the fun and the lusty V6 motor almost brings back the pace as quickly as the brakes can shed it away. The performance is very good indeed with blink of an eye kickdown and no hunting for the right cog that can blight other cars with such as many gears. The ZF 8 speed is equally a pleasure to operate in lazy mode or tiptronic stick or paddle change modes – normal up or downchanges are only really noticed by the rise or fall of the rev counter and engine note – Overall refinement is first class. A vehicle for pretty much anything you can throw at it – or throw it into. 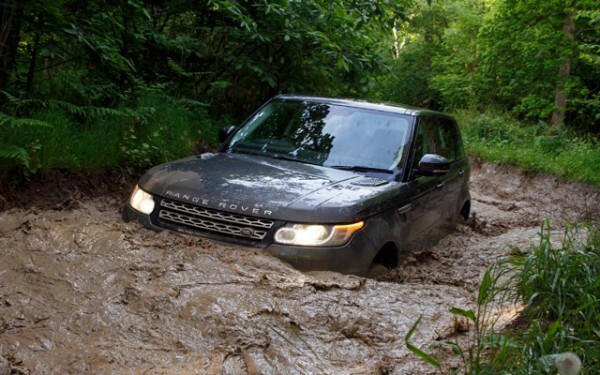 A revised air intake has improved water wading and off roading to the extent thats its almost as capable as the Discovery with the right tyre fitment. General road manners be it on the blacktop or country lane are very good, only the lifeless steering let it down. Of course, its no two seater sports car but the lack of feel and communication through the chunky steering wheel gives the impression you playing an arcade game rather than covering ground quickly. That said, some very spirited cross country driving to avoid a flooded M11 motorway threw up no complaints in the roadholding department with overtaking manoeuvres being swift and confidence inspiring. Overall fuel consumption (despite the dicky fuel gauge) came in at 33mpg overall which for a dark grey coloured flying brick seems very reasonable indeed taking into account there was some very swift driving in parts thanks to the traffic mayhem in Cambridge and Bedfordshire. The Range Rover Sport is a very likeable tool indeed and makes me wonder if the extra expense of its bigger brother is really needed if space is not of absolute paramount. Its refined, smart suited, reasonably well screwed together and has usable technology to make it a cut above cheaper class rivals. You need to ask yourself if this new Range Rover Sport is a better option for everyday life than the “trad” bigger Range Rover, there’s no lesser kudos and it walks the walk while talking the talk. 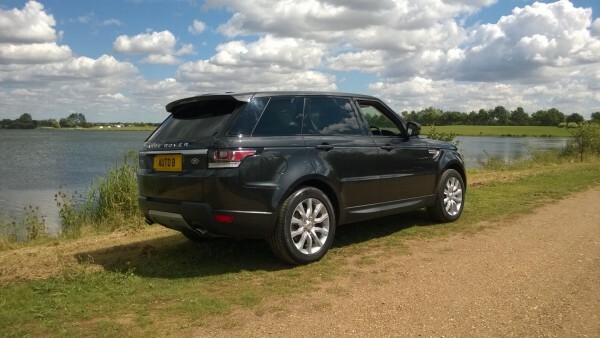 It’s handsome, capable and has an almost automotive St Bernard feel about it and oh, by the way… it’s British. The loose feeling door handles, dodgy fuel gauge and a distant squeak from the saloon were a bit of a let down, but in fairness these press cars tend to be punished mercilessly. Expect better with a fresh from the showroom vehicle though JLR’s quest for light weight and efficiency is noticeable and felt if you look hard enough. As an everyday car the Sport is a vehicle that rewards, cossets and looks after you. Equipment Highlights: Parking sensors – Multi media audio / DVD system – Leather upholstery – Adaptive air suspension – Selective terrain control – Dual zone front and rear climate control – Optional multi view camera system and water wading device – HID adaptive headlamps – LED tail lamps – ECO start stop function. Points of commendation: Wonderful gracious styling – Refined – Comfortable – Barnstorming performance – Brand perception – Well appointed – Capable on any road in any situation – Good use of space – Makes you feel special – Effortless motorway muncher – Effective off road talent. Reservations: Build quality could be better in places – Lifeless steering feel – Can be expensive to service – Multi function computer graphics and font starting to look dated and clumsy – Ticking the options makes it eye wateringly expensive – Electric deployment of 3rd seat row is annoyingly slow. Previous Guest Blog: My Rover R8 is alright mate!